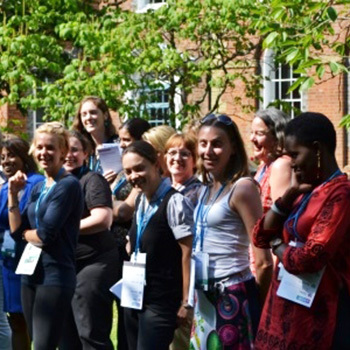 In June 2014 at the Bognor Regis Campus of the University of Chichester, 36 women shared an intense week of enhancing their leadership competencies under the careful tutelage of facilitators from Females Achieving Brilliance (FAB) and the Anita White Foundation (AWF). The roles of the participants reflected middle-to-senior leadership positions, such as executive board members, managers of national sports federations, chairs of regional sport councils, head of operations of organisations, directors/coordinators of major sport programmes, and executive directors for developing a range of sports. The week was structured as flexibly as possible, allowing the participants to take ownership of, and responsibility for, their own learning. From the start, a comfortable and non-threatening environment was created through structured introductory sessions and the establishment of ‘Home Teams’ – six groups who would work together on tasks and reflect on the learning from each day. Participants initially recognised self-doubt in “being out of my depth”, “not having the experience”, and being afraid “to move out of my comfort zone”. Yet through collaborative learning in small groups and partnerships, these doubts were tackled by enhancing attributes such as ambitious strategic vision, leadership and management, performance management, self-management, and communication, team and partnership working. One example of combining the principles of collaborative working, team-building, and leadership was though physical activity. Each Home Team walked, jogged, and ran through Bognor Regis to achieve a number of objectives. Indeed, communication was a central theme for the day. The different techniques and styles available are crucial factors in efforts to persuade, influence and motivate others. Ways to construct powerful questions, emphasising empathetic listening, and how to better establish trust constituted these sessions. The evening saw more physical activity through a multi-national netball tournament organised by the participants. Abilities ranged from Mary Waya’s international-level playing and coaching expertise in Malawi to a few women who did not know netball even existed. The third day tested a variety of techniques toward conscious career planning and scenarios for dealing with difficult situations, conversations, and people. The different strategies provided “a great opportunity to reflect on myself”, but were also described as being “useful to put myself to sleep!”-however, it was clear that all recognised the importance of acknowledging difference in leadership. 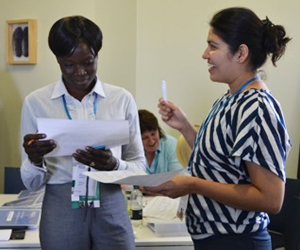 Using a variety of practical activities, day four allowed the participants to identify and enhance how to engage with their important stakeholders, a leadership team, or generally work in harmony with the culture of an organisation. 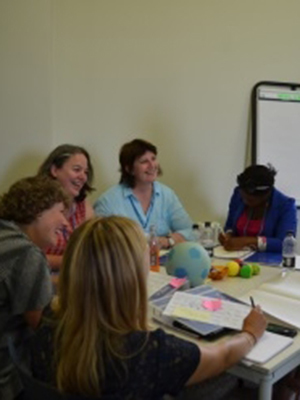 The expertise of FAB volunteers and the AWF were then drawn upon for three breakout sessions on the Women and Sport Movement, coaching, and conflict management. The afternoon was dedicated to a core theme of WSLA 2014: moving out of your comfort zone. The participants worked with the band Greymatter to enforce a growth mindset by singing Let It Be by the The Beatles in front of an evening reception of dignitaries from the University and organisations who had sent participations to WSLA 2014. The evening was a chance to celebrate the success of WSLA 2014 and listen to a very important guest. Liz Nicholl OBE, Chief Executive of UK Sport, gave a speech which connected with the principles underpinning the programme during the week. Liz reflected on her experiences of being a female leader in the patriarchal structure of sport, including how working closely with her team provided so many beneficial results. The AWF and FAB would like to thank the University of Chichester for its tremendous support, as well as a range of organisations and individuals in attendance who had donated or sponsored the attendance of the participants. 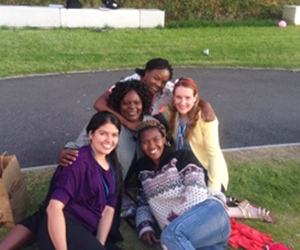 "Before attending WSLA 2014 I thought that only my colleagues were doing bad. After attending WSLA 2014, I changed my point of view and starting seeing things differently. I saw that I had work on my behaviour. Today I feel more confident and I am really doing well. I feel stronger and stronger. I tried to market myself to the International Paralympic Committee (IPC) by sending them the report of my work on the Burundi Paralympic Movement, and from there they selected me to participate in the Paralympic Youth Coordinator workshop which took place in Rwanda in September 2014. I was also selected by the IPC as a program lead for a workshop in Bonn, Germany, in October 2014. I was elected to represent women in the East Africa Paralympic Committee in November 2013, but I did not organize even a small workshop of women because I did not trust in myself despite of all the work I have been doing. After WSLA 2014, I organized a small meeting with women in East Africa to prepare a workshop in November 2014. All this progress is because of the WSLA 2014 facilitators, participants and especially my Home Team."